We all see the world we live in but only the selected few know of the unspeakable forces that exist outside our own boundaries of existence. These forces are sometimes known as phantoms and they can either be good or evil. There is a legend whispered among children that is sometimes laughed at by adults, the tale of the Boogiepop Phantom. If you cross her path on the darkest of nights, then you may never be seen again. She is sometimes known as Death. Five years ago, a series of horrific murders had unleased a myriad of powerful psychic forces that now plague the city. 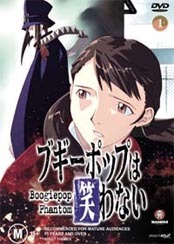 Boogiepop Phantom is the tale of this city and the stories that take place around these ghastly murders. The first volume of Boogiepop Phantom is all about mystery and intrigue in this dark world from award winning directory Takashi Watanabe. The first three chapters of this series all involve different characters who are somehow linked together by these mysterious and creepy tales. It's Anime meets the X-Files with awe inspiring animation and compelling storylines that will leave you craving for more.